Advanced Micro Devices (AMD) recently held a media event in Sydney, Australia, to talk about the convergence of the video game and film industries, and how AMD’s technology can drive that. 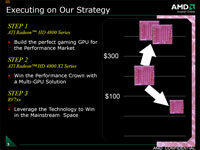 The convergence is described in the context of AMD’s vision which has been given the moniker of ‘Cinema 2.0’. It was an historic event, not only because it marked the first time that ATI had ever done a proper media relations event in Australia, but also because they unveiled a worldwide exclusive: the announcement of their ‘secret weapon’, that being the hitherto unknown Radeon HD 4850X2. It is scheduled to launch at a price of AU$469 RRP, which puts it in the price range of Nvidia’s GTX260, but with claimed performance comparable to, and at times exceeding, the more expensive GTX280. It should be one to watch out for, and we can expect to see this released in the coming months. Dave Erskine (Senior Manager, Corporate Public Relations) began the formal session, with a presentation that explored the relationship between film and video games. Cinema 2.0 is AMD’s response to the gradually blurring line between the two mediums. 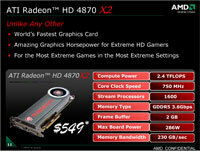 AMD hopes to exploit this exciting change with increasingly powerful GPU’s, the latest being the product launched today, August 12, the dual-GPU flagship ATI Radeon HD 4870X2. Expect to see it in Australia with a RRP of AU$669. Next up in the presentation was some excerpts from game developers representing Splash Damage (Wolfenstein: Enemy Territory, Enemy Territory: Quake Wars), Crytek (Far Cry, Crysis), Rebellion (Rogue Trooper, The Simpsons Game), Frontier Developments (The Outsider, Rollercoaster Tycoon 3) and Remedy Games (Max Payne, Alan Wake). These clips revealed a general consensus that the requisite technology for photo-realistic game engines is 5 to 10 years away. So they thought. One of the main purposes of the event was to convince the public that photo-realistic gaming is not as far away as the game developers suggest. To illustrate the point, the latest adventure of ATI’s household buxom vixen, Ruby, was shown. This entailed a city scene where Ruby was chased by a maniacal four-legged robot. The scene featured impressive lighting & reflections, camera focus variations, a fish-eye lens effect, physical deformation and generally an incredible level of detail. 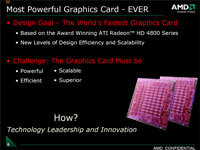 Almost unbelievably, it was rendered on a single Radeon 4870. Check out a couple of screenshots below. When I queried him about the possibility of a unified frame buffer (shared memory) on future dual-GPU cards, Mr. Cheng revealed that it is possible, and that it is currently being investigated by AMD. Another attendee queried Mr. Cheng on why Crysis results were omitted from most of the benchmark results, to which he responded that 4800-series owners can look forward to 40% improvements in CrossFire results in the near future. Improvements aside, the Crysis result from the following slide seemed quite impressive to me: ~30fps @ 2560x1600, with 4x Anti-Aliasing and 8x Anisotropic Filtering. The almighty system-crippling beast of a game has almost been tamed! 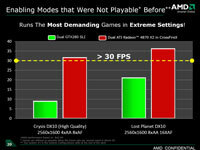 AMD also took the time to be explicit in their rejection of rumours which have been circulating in the past 12 to 18 months, which posited that ATI were essentially giving up in the ongoing race to have the fastest GPU on the market. We all know that actions speak louder than words, and the 4870X2 is, in effect, ATI’s answer to those rumours, and quite a comprehensive answer at that. Look out for a full review on OCAU very soon. Thanks to AMD for giving Australia the focus we deserve as a proud gaming nation, and I sincerely hope they can stick to their word and do it again next summer!